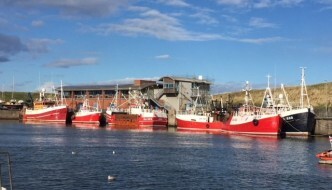 Eyemouth Harbour, provides a sheltered anchorage for cruise vessels, passengers are able to step ashore directly into the heart of this enchanting historic town, with everything you need for an enjoyable visit within walking distance of our landing pontoons. We welcome working with cruise lines to bring visitors to this beautiful coast and hinterland of South east Scotland and North east England. A warm Scottish welcome awaits you in Eyemouth. A traditional fishing town with plenty of things to see and do, Eyemouth has many visitor attractions, restaurants, cafes and shops. Gunsgreen House was built in the 1750s for infamous local smuggler John Nisbet from the proceeds of his lucrative trade, to this day, Gunsgreen is still a House of Secrets. Eyemouth Museum is based in the centre of the town and documents the fishing and social heritage of Eyemouth, brought to life in its exhibits and through stories from local people and the fishing disaster of 1881. There are also some wonderful walks and great places to watch the spectacular sea life, or visiting St Abbs Heads nature reserve. For those who wish to spend time exploring further afield, the Scottish Borders and North Northumberland has a wealth of experiences on offer. The Scottish Borders is an unspoiled, hidden gem; an area rich in history and culture which offers many opportunities to explore unique and varied countryside. The following is a list of popular excursions that are available. It should be noted that these details are not definitive but are intended to demonstrate the range of excursions and activities available to cruise passengers visiting Eyemouth as part of a cruise. Please note that, in many cases and with prior arrangement, half day tours can be combined to create full day itineraries. There is a wealth of magnificent Historical Houses offering a fascinating insight into Scottish history. Explore the opulence of Manderston House a supreme country house of Edwardian Scotland; the swan-song of its era, on which no expense was spared with luxurious staterooms and the only silver-staircase in the world. Near the lovely town of Kelso is Floors Castle, the largest inhabited castle in Scotland which has been home to the Dukes of Roxburghe since 1721, or Mellerstain House a fine example of Robert Adam’s architecture and interior decoration, one of Scotland’s greatest Georgian houses. Visit Paxton House one of the finest examples of neo-Palladian architecture in the whole of Scotland. The house possesses one of the UK’s foremost collections of Chippendale and William Trotter furniture. The Scottish Borders is one of Scotland’s loveliest regions, known for its gentle hills and beautiful river valleys, you will also find the remains of The Border Abbeys founded 1124 and 1153 AD by David 1, King of Scots when some of the most fashionable and austere monastic orders from Europe built monasteries on an unprecedented scale here. Melrose Abbey is a fine example of the wealth the monasteries had, gaining their fortunes from the wool trade. Robert the Bruce’s Heart is buried here. Dryburgh Abbey has retained some of the best preserved outbuildings of any monastery in Scotland – such as its Chapterhouse. Not far away are also Jedburgh Abbey and Kelso Abbey. Within in an easy drive of Eyemouth there are a number of wonderful gardens and local craft and food producers, a visit to The Walled Garden at Floors Castle with its terrace garden café and deli, provides a great place to stop off and explore the gardens as well as sample local produce. Not far away are the beautiful gardens of Monteviot with Japanese Acer and Pieris border underplanted with Candelabra Primulas, a real feature of Monteviot, and Mertoun, with its walled garden which is still used to grow flowers and produce for the big house, is a real delight. Or visit Teviot Smokery and Water Gardens with its fantastic smoked salmon and deli counter, craft shop and the water gardens that go right down to the river Teviot. Situated in the stunning location on the banks of the River Tweed is Abbotsford House, where Sir Walter Scott was inspired to create his poetry and novels. Abbotsford is a great home designed by the writer and as such you can see all around you the physical representation of the Romantic Movement. There is an interactive visitor centre depicting the life and the works of this great writer, you are then welcome to explore the house and gardens. Sir Walter Scott spent much of his life in the Scottish Borders and is buried at Dryburgh Abbey, it is also worth visiting Smailholm Tower where he lived as a young boy, which is now a museum. The island of Lindisfarne is a fascinating place to visit, it has been a centre for pilgrims since St Aidan founded the monastery in AD 635, St Cuthbert is the most celebrated of the priory’s holy men and was buried on the island, the Lindisfarne Gospel was painstakingly worked and lovingly crafted here over 1300 years ago and an electronic version can now be seen in the Lindisfarne Heritage Centre, which also shows a complete history of the island. Overlooking the island in Lindisfarne Castle which is a small fortress built in 1550 and in now managed by the National Trust.